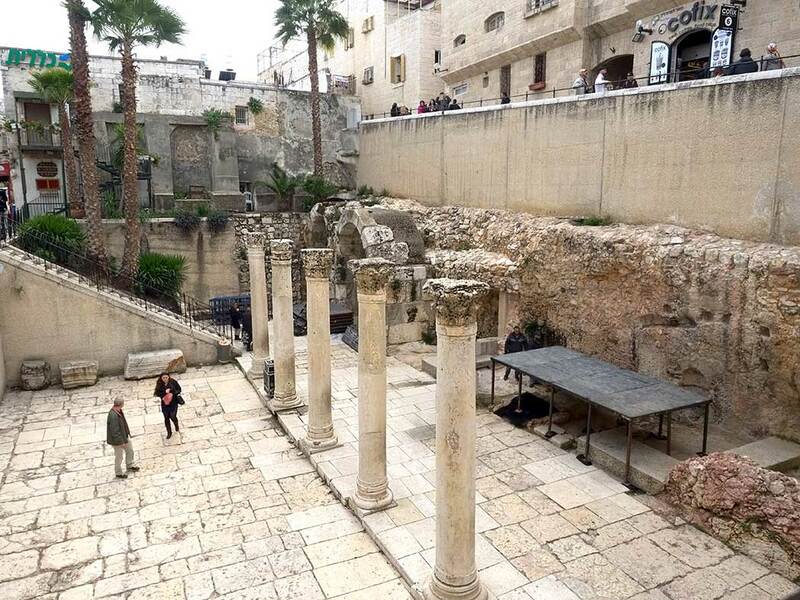 In 1969, excavations below the present day street level in the Jewish Quarter of Old City of Jerusalem revealed what appeared to be an ancient Roman road and a row of Corinthian columns. To determine its significance, researchers turned to the Madaba Map, a floor mosaic in the church of Saint George at Madaba, Jordan. The most detailed portion of the Byzantine mosaic map is a depiction of Jerusalem. The colonnaded boulevard is clearly shown on the map as the main north-south artery in the city, a street that Romans would have named the Cardo Maximus. The original road was flanked on both sides with colonnaded, covered walkways that fronted on market stalls. The excavations in the Old Quarter revealed a portion of the colonnaded walkway on the western side of the Cardo Maximus. Developers proposed creating a modern day shopping arcade that would preserve the style of an ancient Roman street. Unfortunately, the discovery was made during a time when there was a great deal of pressure to develop and repopulate the Jewish Quarter in the Old City. Rather than uncovering the entire length of the Cardo Maximus, excavations were limited to the small area that had already been exposed. By 1980, it was surrounded by housing units and shops. Today, the Cardo Maximus is used mostly as an entertainment venue for live music.